These superb hammock chairs provide the ultimate in comfort, and different design patterns mean there are multiple styles to choose from. Choose a design with dainty hummingbirds clamoring around a flower in the garden, or select a chair with a large orange crab print design. 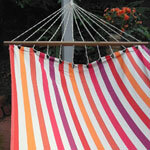 Hang this hammock chair from a tree branch and gently sway in the breeze from within your own lovely garden. Don't just tend to your garden, but enjoy it by sitting among the pretty flowers and marvel at the insects and birds that frequent the outdoors around your home. Unwind with a cool drink and a good book and listen to the birds. Heavy duty rope ties and a 33-inch Chilean pine spreader bar keeps the hammock chair balanced and supports up to 250 pounds in weight. The cushions are made of polyester, which resists the weather, mildew, and fading.